When parents of children suffering from muscle diseases contact Dr. Daniel MacArthur’s lab, it’s often after they’ve exhausted their options. The MacArthur Lab specializes in identifying neuromuscular diseases by looking at long strands of genetic sequences using software they’ve written and open-sourced. Great moments as a PI: watching on the lab @SlackHQ as @theFourier2k diagnoses muscle disease patients in real time at 11:30pm. But what does that actually mean? We asked the good doctor to explain it to us. Slowly. “On that evening, we had a fresh batch of data from about 50 families, and Dr. Monkol Lek [a member of the team] was analyzing samples individually, running a series of algorithms looking for rare DNA changes that might explain the disease in that family. A bioinformatics group that’s as much big data startup as medical research team, the MacArthur Lab shares space at Massachusetts General Hospital as well as Harvard & MIT’s Broad Institute. For the roughly 15 people in the lab, split over those two locations, Slack has become an essential tool in their arsenal, helping them communicate while they diagnose the most difficult cases. Their cutting-edge analysis techniques result in successful diagnoses in around half of all the cases they take on, often solving years-long mysteries for families affected by extremely rare diseases. 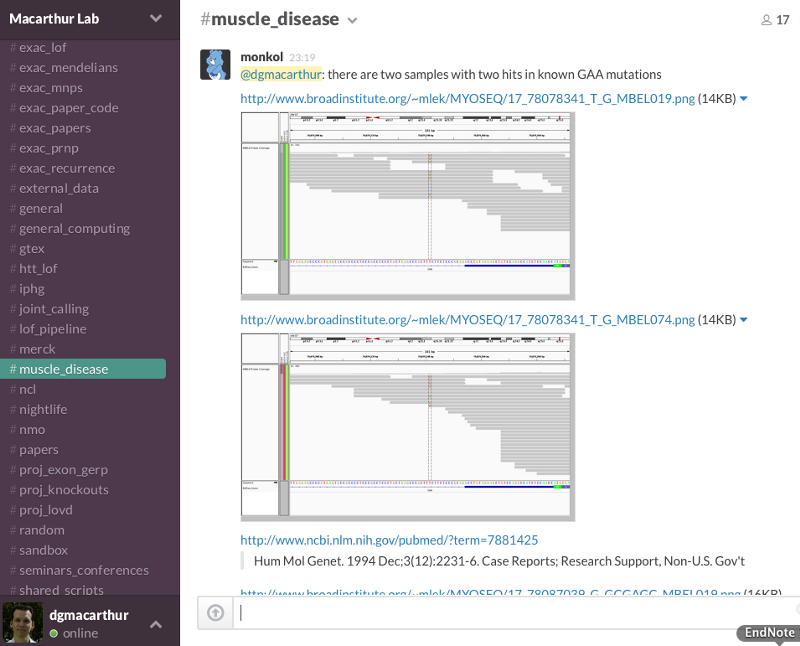 While much of the technology used in the Lab is specific to bioinformatics, the reporting, output, and code behind it all gets posted automatically to Slack channels. Results from analyses get posted directly into relevant channels which can be analyzed immediately by team members, and are searchable forever more. Dr. MacArthur realized Slack was working when he noticed email usage went down precipitously. Additionally, instead of private one-on-one email communications, conversations moved into open project channels where the whole team could see them, making it easier to share new methods and code. As the team’s 15 members are spread across multiple locations with coding and analysis happening around the clock, Slack acts as the heart of it all, stitching together the lab’s culture and communication.